However, I personally don't really enjoy glass-contained candles. They give, for me, this strange impression of not being real candles. They are closed in the container, imprisoned. Tamed. 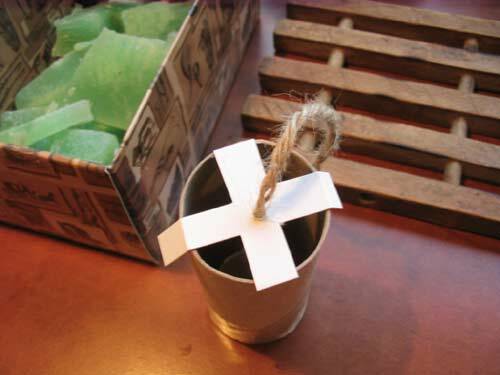 This tutorial will not, therefore, be about making candles that stay in the glass. 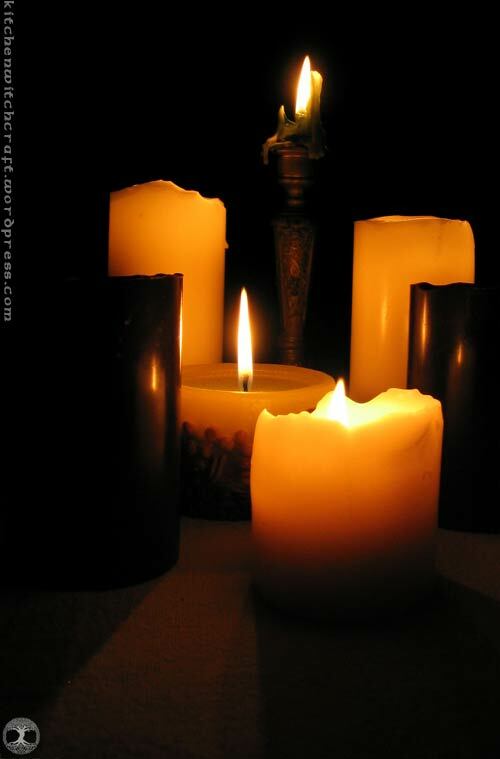 It's about using a glass to make a standalone, pillar candle - which is actually the simplest process in the world, and with Imbolc coming, we can all use a few more candles! A thick glass receptacle (drinking glass, jar, what have you) that does not taper at the mouth. Not even a tiny little bit. This is the most important part - if your jar or glass has a narrower mouth than the body, You will not be able to get the candle out. When in doubt, use a drinking glass that actually broadens up. A length of natural string for the wick. It must be 100% cotton or hemp or other natural fiber. Synthetic strings emit poisonous fumes when burning and stink something wicked. 1. Cut a shape in the cardboard that will be identical to the bottom of your receptacle. So if you're using a round drinking glass, it will be a circle. Remember that it's bigger on the outside than on the inside, so it may take a few adjustment to make it right. Your cardboard should fill the glass and stay there without moving. 2. Make a small hole in the middle of the cardboard and thread your string through it. The whole idea here is to secure the wick in the middle of the candle in a way that will prevent it from moving while the wax sets. People who make candles that stay in glasses do this with glue and such, but we want to take it out again, so we need something secure, yet temporary. Put the "foundation" in the glass. If you cut out the right shape, it will stay there nicely and all will be well. 3. Cut a cross out of cardboard that's larger than the glass mouth, thread the other end of the wick through it and fold the arms around the mouth to fasten it at the top. 4. Melt the wax in a double boiler, and pour it slowly into the glass. Some of it will get under the cardboard, but that's okay, as long as it's not all of it. If you go gently and slowly, it should only be a thin layer. 5. Leave the candle to cool off. While it cools off, it will sink on itself, probably making a small crater around the wick. That's normal, but it means you may want to keep some of the wax by to cover this up after the candle has set. When you are sure the candle is finished, has cooled off completely and absolutely and no parts of it are warm (this can take several hours, depending on size), it's time to take it out of the glass. This is actually astonishingly easy: just put the candle into the freezer for an hour or two. 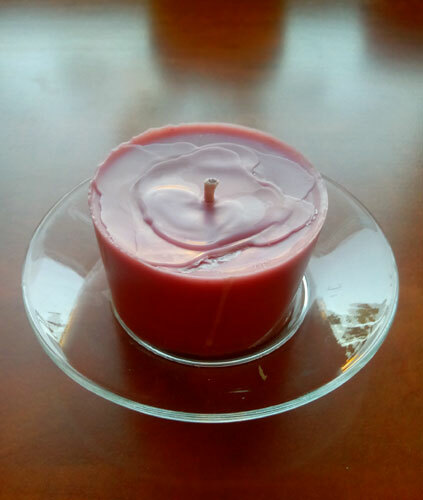 Wax loses some of its volume as its temperature falls (hence the crater), and freezing it will make the candle shrink just that tiniest fraction of a millimeter to make it slide out of the glass. That's why you need a straight, or widening glass - it will only shrink the tiniest bit. But you will get it out clean and ready, no scratching with knives, no stains, no hassle. Now you can peel off the cardboard from the bottom, crumbling off any wax that was under it (this can be used for finishing touches), and cut the wick that poked out. If the bottom is uneven and the candle won't stand, heat up the empty double boiler and set the candle on the warm surface of the pot. Melt just enough of wax to even it out. The disadvantages of this method are very few: one is the necessity for a straight receptacle, and the other is being saddled with the shape of said receptacle. I don't actually enjoy my candles broadening out like fans, and you'd be amazed how few drinking glasses are actually straight. You also need to have a freezer that will fit them, and you need to cut that cardboard well. But that's about it, and on the other side are, hey, free candles. You can basically do whatever you want with this. Layer on layer of different colours. Big pillars in beer steins. Small votives in vodka shots. There's zero risk of spillage, only the tiniest waste on wax (what's left in the double boiler), and the glass itself won't even need that much cleaning afterwards because the wax comes right off. It's basically the best method I've come up with so far. This is serious knowledge! Use it wisely, fellow witches! site needs a lott more attention. I'll probably be back again tto read through more, thanks for the information!